9 years…It sounds like a long time. It is a long time. Wow, that really is a long time. But somehow it’s still just yesterday morning. The emotion is still almost as raw as it was that very morning. The videos, stories, and photos are as difficult to watch today as they were then. We all say that. Yet somehow it doesn’t translate into what our lives look like on the 9/11 anniversary each year. By and large most people will think about it for a minute on their drive to play – when the weekend DJ mentions it on the radio. A lot of activities are actually scheduled to take place this weekend – on Sept 11 – and don’t have a single inclusion of any sort of memorial….see: Castle Rock ArtFest if you live here (and if you are going for some reason, tell the organizers). There isn’t anything more to say about it than I already have. If you aren’t going to go and do something special to remember those lost, than I’m not going to convince you. What I do ask is that for those that are remembering, remind everyone else. Make it a priority to discuss around the campfire, or at church/temple, or at your BBQ, or at the ArtFest. Don’t let everyone else forget. And at the very least (if you’ve read this far in the post), look at the names below. Each year I participate in a Stair Climb in Denver to remember the 343 firefighters that were killed. This will mark the 7th year and the first year that there are sites around the country doing it. We climb 110 flights of stairs in full gear – the same height as the World Trade Center buildings. If you can’t do something like that, at least do something. As last year, I post this photo…a stunning capture in history (read story here). 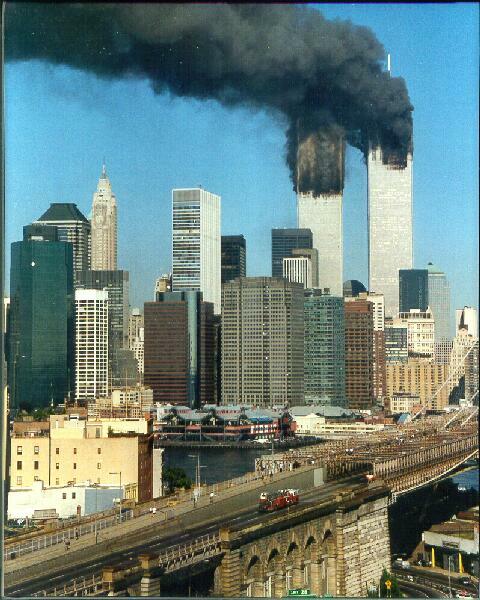 This is a photo of FDNY’s Ladder 118 responding to the WTC. None of them would survive the day. These guys knew what they were getting into, yet they didn’t hesitate. Stop calling your college quarterback escaping from a sack heroic. This is the definition of heroism. Remember. NEVER FORGET.